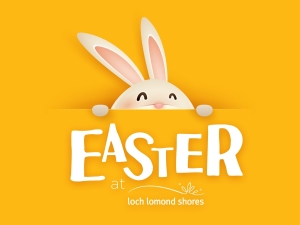 Kids can get crafty and creative and will have a ball with lots of Easter themed family fun at Loch Lomond Shores! We're all at a loss trying to think up ways to entertain ourselves, and our families, during holiday times so this Easter we have pulled together lots of ideas and choices for you. Every single day there is lots on with our great selection of activities here on the banks of Loch Lomond. Why not get up close to some amazing Birds of Prey at our very own purpose built centre. Or if fish and aquatic creatures are more your style, then check out Loch Lomond SEA LIFE Centre. And if you're feeling energetic then why not lose yourself in the trees with the thrill of TreeZone aerial adventure course or hit the beach for some boats, bikes and great fun with our new beach activity team?s water walking balls, bike hire & boats. We also have our cabins in our Market Area, serving up fudges, home-baking, freshly ground coffee and ice cream sundaes, and there's always some action alongside with them with the play park and some cool entertainment. As well as the schedule of events, all the regular attractions will be open, including Loch Lomond SEA LIFE Centre, Loch Lomond Bird of Prey Centre, Lomond Pirates soft play, Dragons’ Den Playpark, and TreeZone aerial adventure course. Saturday 1st - Sunday 19th - Beach activities (water-walking balls, canoe hire, etc.) Small charge applies. Monday 3rd - Monday 17th - Thomsons Funfairs funfair rides. Small charge applies. Tuesday 4th - The Regal Storytellers, 12-4pm. Free storytelling sessions throughout. Monday 10th - The Regal Storytellers, 12-4pm. Free storytelling sessions throughout. Monday 17th - Meet the Easter Bunny, 12-3pm. Free. Regular appearances with breaks each hour. Final appearance outside Thorntons in the Mall from 2:20pm. While we take every opportunity to ensure the details for Easter Holiday Fun are accurate, we always advise that you contact the event organiser before setting out for the event to avoid disapointment.